Nikola Tesla discovered free energy by using alternating current in a coil creating perpetual motion. He understood that many energy sources exist in nature, and when we can tap into that resource it is our gift from the earth. Tesla did not feel that electricity should be a luxury, it was meant for everyone to enjoy freely, like breathing the air. Tesla designed a generator using an induction motor, this was the design to bring free energy to the world. Tesla, with the financial aid of Westinghouse, was able to bring electricity to the 1st World’s Fair held in Chicago, IL in 1888. Not many people remember this, but Tesla also created the largest hydro-powered motor in Niagara Falls, NY. 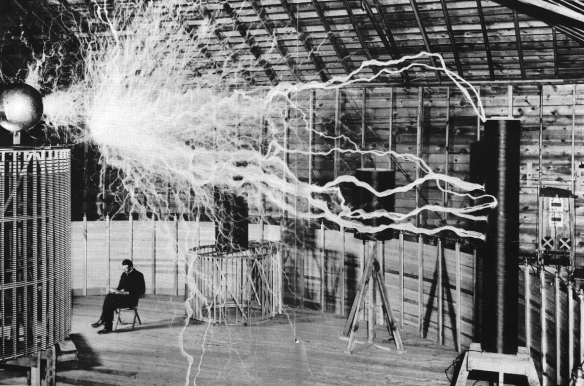 Tesla coils produce radiant energy, as well as having a unit of measure named for him. Of course, he did not get the deserved attention while he was alive largely due to Edison’s public smear campaign. Alternating current was used in the first brutal death penalty sentence, and horrified many as to the dangers of an “uncontrollable” energy force. However, it was probably this difference that caught the attention of the military, curious about Tesla’s “Death Ray”. While working for Westinghouse, he began to design the first ever form of wireless communications using telegraphy. It was not Tesla, but Guglielmo Marconi & Karl Ferdinand Braun to receive the 1909 Nobel Prize for Physics for their contributions to the development of wireless telegraphy. Patents that Tesla did hold expired and became public. It was not until late in life and after his death that he was truly acknowledged as a pioneer in his field. Tesla’s original research on radiant energy is used today in the HAARP program in Alaska. Tesla had suggested that the earth’s weather could be changed by focusing energy sent to the Earth’s ionosphere by microwave radiation. The ionosphere is a region of the Earth’s atmosphere consisting of a density of ions, resulting in absorption of high energy ultra-violet radiation from the Sun.